Mutianyu Great Wall is around 1.5 hours of driving from downtown Beijing, or 1 hour 20 minutes if you are coming from the airport by road. It is a good alternative for Badaling. With fewer tour buses and stops, Mutianyu is much quieter and easier to walk in than Badaling. Besides being the longest fully restored section of Great Wall, Mutianyu attracts visitors because it has the convenient facilities including cable car, chairlift and toboggan. With the easier walking conditions and fewer crowds, Mutianyu is much more enjoyable to walk in than Badaling. The best way to have an exciting tour of the Mutianyu is to start very early at the crack of dawn. Getting to Mutianyu early in the morning you will enjoy the best walk, with the perfect opportunity to ride cable car or chairlift for the shortest trip up the wall. You should, however, relieve yourself before reaching the Mutianyu since there are very limited restrooms. The entire Mutianyu section is 2.2 kilometers long, going early in the morning, therefore, gives you adequate time to tour all the towers starting from the first to the twenty tower. Walking the Great Wall of China is no stroll in the park although the surface of Mutianyu is generally smooth. The section between tower 19 and 20 (left towers when you’re facing the entrance) is really steep, containing approx. 450 steps. If you find climbing vertical steps exciting, you will enjoy this part of the wall. Similarly, the vertical steps between the 1st and the 6th towers may add the difficulty of your walk. If you are not in good shape, you may struggle. However, thanks to the cable car and the chairlift, you can still get to the top of the Mutianyu without hiking up the wall. You only need to book a seat in the either. A word of caution, though, you cannot use a toboggan ticket on a cable car and vice versa, as different companies run both the chair lift / toboggan and the cable car, and do not accept each others’ tickets. A return ticket for the cable car will not get you down on the chairlift or toboggan. You can buy tickets for all three at the top, so best to decide before you go. Check the Mutianyu weather forecast before you start your walk, if heavy rain/snow/low cloud or other severe weather conditions is predicted then postpone your walk for another day. How long is the Mutianyu Walk? The entire Mutianyu walk takes approx. 2 -3 hours, with plenty of relaxation, resting, picture taking along the way. 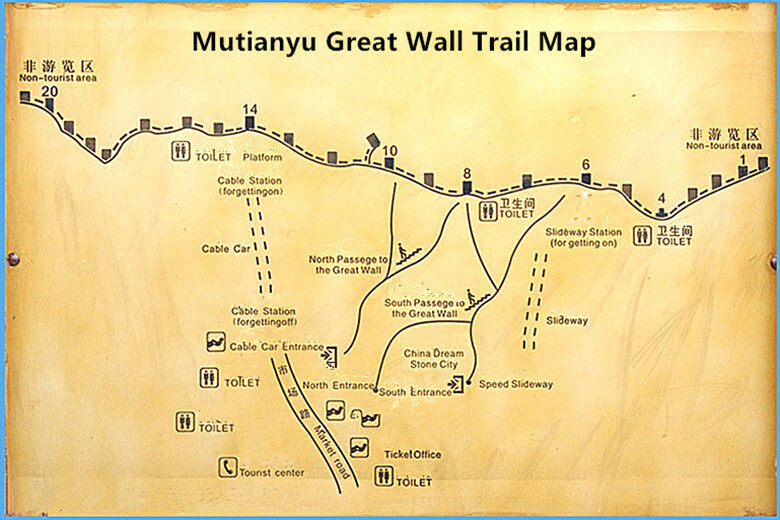 The Mutianyu trails are are well formed and easy to follow, which makes walking along it relatively easy. It takes on average of 40 minutes to hike uphill to the wall , with some breaks regardless of individual fitness, age and/or length of stride. Walk up the trails you will reach the sixth, eighth or tenth tower. If you are coming from the Dream Stone City or the South Entrance, near the toboggan, walk up the stairs you will reach towers six or eight. Alternatively, walk up from North Entrance close to the cable car station, and ascend the stairs till you reach tower eight or ten. If you are in search of a fast and convenient way of returning to the entrance, your solution lies in riding the toboggan. Situated on between tower 6 and tower 5, no marking, near a side gate on the Wall, toboggan runs for 5184 feet or 1580 meters long. Open hour: 8am-5pm in summer. 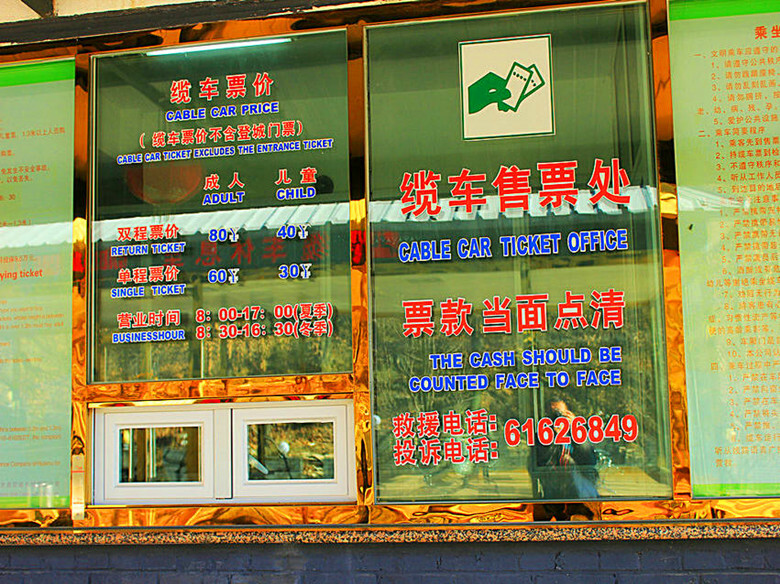 8:30am – 4:30pm in winter and costs 60RMB per person. From 1998 when it started operating, the toboggan runs all year around, only pausing operations during extreme weather conditions like heavy rains or snow. Mutianyu Great Wall Toboggan uses the theory of acceleration of gravity and makes you dive along the mountain path like low – latitude flying or high – speed driving. The toboggan ride goes down a series of zigzag bends, with an altitude difference of 100 m (328 ft). Carts for single and double is available so that adult can keep their child accompany during the toboggan ride. The toboggan is fun, safe and not scary at all, although you may be backed up a little. Moreover, it is easy to use control features – push handle forward = speed up, pull back = brake. Avoid getting stuck behind other riders who are scared of moving fast, if you don’t want to ruin your fun. Mutianyu Toboggan down cost: RMB 100. So when is the best time to ride the Toboggan? 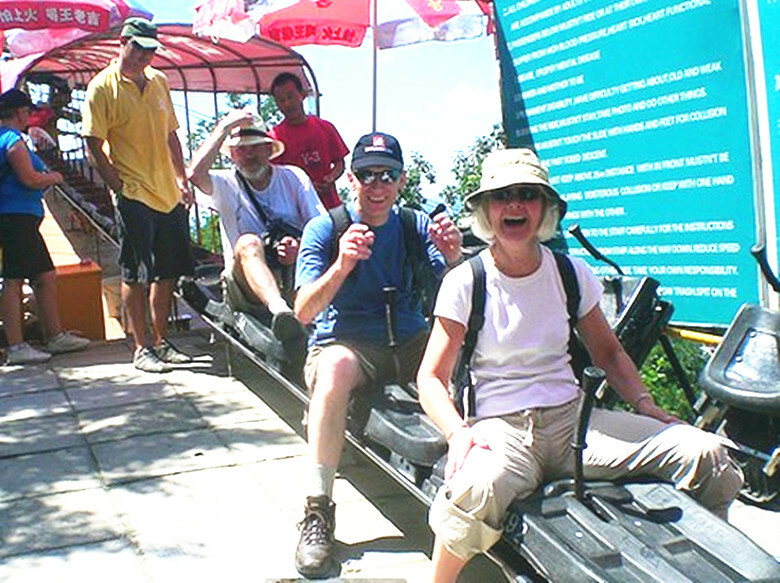 The perfect timing to have a memorable toboggan ride on the Mutianyu is on weekdays. Go either early in the morning from 8 am to 11 am or much later in the afternoon between 2 pm to 5 pm. Try, to avoid visiting the Mutianyu during holidays or on weekends, as more people would take weekends to explore it, making the Great Wall rather crowded than usual. The sick, the elderly as well as children below the ages of ten or have a height measuring less than 130 cm, must be accompanied by a responsible adult to ride. A 550 meters long open chairlift will take you from the parking lot to tower six and vice versa under ten minutes. The open ski-lift kind of cable car can comfortably accommodate 2 passengers side by side. The ride offers a perfect elevated opportunity to sit back, relax and savor the breathtaking beauty of Mutianyu Great Wall section. It works from 8 am to 5 pm during summer, while in winter, it runs from 8:30 am to 4:30 pm. The good thing about the chairlift is that if you have two-way tickets, you can ride down either using the chairlift or the toboggan. The chairlift give you the chance to relax if you had a longish hike, sit back, and enjoy the scenery. If the prospect of climbing the Mutianyu turns you off, then you will love the cable car. It is a six passengers seating capacity vehicle, which offers a convenient and efficient manner of getting to the top. Open hour: 8am-5pm in summer. 8:30am – 4:30pm in winter. The cable car brings you to the platform close tower 14. 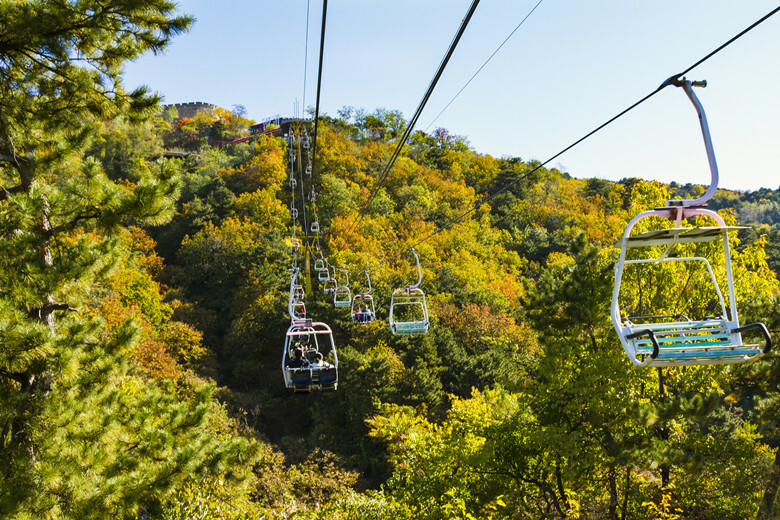 You will notice that two separate companies operate the cable car and the chairlift at Mutianyu. If you take the red enclosed cable cars, it will take you up to the 14th tower from where you can either descend the wall or continue walking uphill. 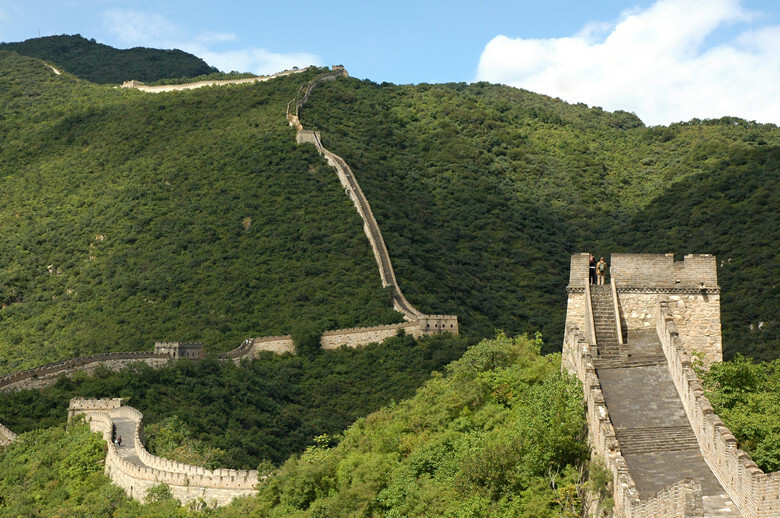 All in all, touring the Mutianyu section of the great wall is a rewarding experience and a productive way of spending your holiday. Mutianyu Great Wall entrance is approx. 3km away from the ticket booth / parking lot. You can either ride a shuttle bus (15RMB p.p / 10 minutes ride) or walk to the entrance. Shuttle bus is convenient and drops you off outside the entrance. Then you can either go up by cable car / chairlift (approx. 10 minutes ride) or just climb up. When you finished, you can return to the parking lot / ticket booth by shuttle bus.